During his first class of the day, Mr. Lawrence tried his best to remain calm and collected throughout the lesson, but his students could tell that something was wrong. After a short while, they asked him what had happened to make him act so differently. 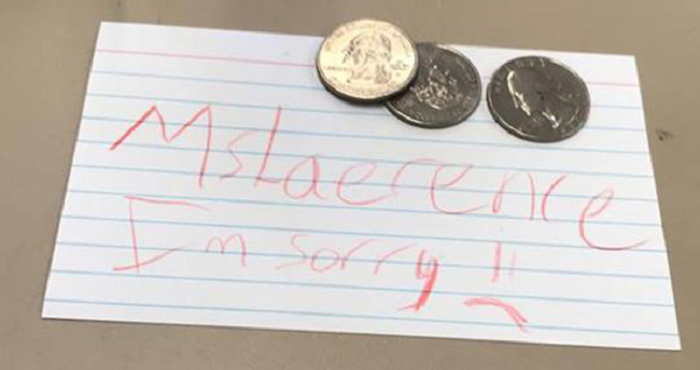 He wasn’t sure how to start, but his explanation went on to move one student to take action in the most heartwarming way. He told the students that his father-in-law had passed away over the weekend and that he was worried for her. She wasn’t taking it well, but he still needed to be at work. The students, he said, told him that they were sorry for what had happened and they tried their best to remain attentive to the lesson. At the end of class, each student gave him hugs and high-fives…until the very end, when the last student gave him something. This is for your wife. I know it was real expensive when my daddy died and I don’t really want ice cream today anyways.” She said. She had done what she could. She knew his wife’s pain because she had experienced it just the same. It wasn’t much at all, but to Price Lawrence, it was everything. He shared the photo with his friends and family…but it instantly went viral. The young student’s generosity was inspiring, and although the story surrounding it was incredibly sad, people were heartened to see such a young child paying attention to the needs of the people around her.